I have been fascinated by tattoos since I was a kid. I always admired the art work and knew that when I got older I would get one. Just yesterday I got my third one and I feel compelled to tell my story and those of my friends because getting a tattoo is a personal journey and I always want to hear those stories and I’m thrilled to have the chance to share them with all of you. My first tattoo was an adventure, my sister Crystal and I had decided to take the plunge together, I don’t remember talking much before hand only that we had both decided that we wanted on and that we wanted to get our first together. We went to a small tattoo parlour over 10 years ago now with no real ideas in mind (well I didn’t) I think she knew she wanted a dragon. I looked a the available books and found one that I loved and that was it we got it done. I didn’t realize until I got my second that the first artist I had maybe, shouldn’t have been doing this for a living. I remember that it hurt like all heck and I cursed loudly and often during the process but I’m proud to have done it. Crystal has not yet gotten a second as the first left a not so nice impression on her but I think she will go for another one soon. Crystal’s dragon on left my uh…not sure what on the right. For my second one, it was a birthday gift from a friend the sad thing is 4 days after I got it my mom had her stroke so when I look at it, I have mixed emotions. It didn’t hurt as bad as my first but I still managed to bruise my friend’s hand as I sat there and endured it. The feather is from a picture I had seen when I was looking for my next one, I seen lots of watercolour designs and fell for all of them. 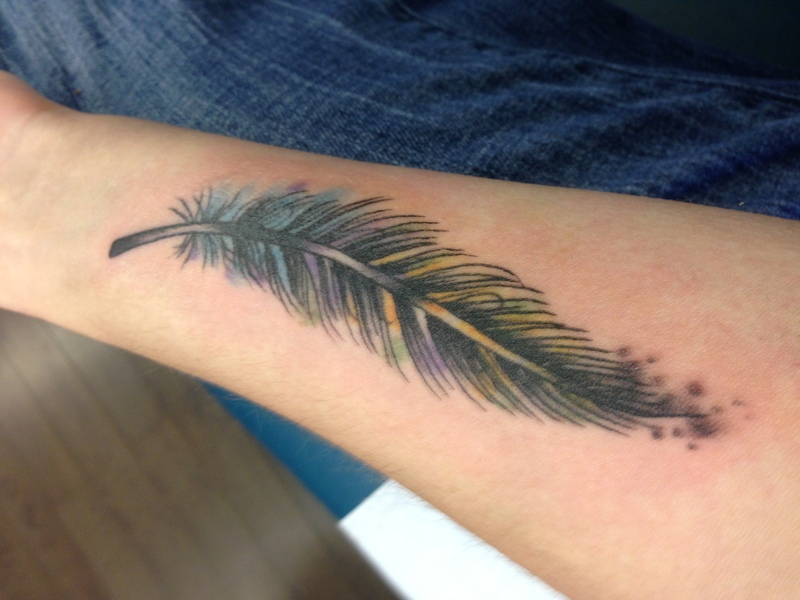 I think for me the feather represents lightness, to always remember that no matter how hard things get there will always be something to smile about. My most recent one is very special to me, it was done with my friend Donna as a birthday gift for her. Donna has just celebrated her 50th birthday and we had been talking over the last few months about how she wanted a tattoo so we made it happen. When I asked Donna what made her decide to get one she told me it was to turn over a new chapter in her life, over the last few years she’s had a rough go of it learning she had thyroid cancer (she had her thyroid removed and thankfully is cancer free) as well as having to endure other medically required surgeries. She told me that she had thought she may have been able to share the experience earlier with her sister-in-law but it just never worked out as her sister-in-law decided that getting a tattoo was not something she had wanted to do. When I asked Donna what made her choose the design she did (pictured below) she says that it’s a tribute to her Irish heritage, her grandmother on her mother’s side was born there and holding on to those roots became very important to her mother and in turn her. We looked at many designs over the last few months before decided to mash a few ideas together and with the artist help it turned out to be a very awesome piece. When I knew we would be doing this together I wanted to find something that represented this, that we did this together and I wanted to find something that matched the Irish theme of Donna’s tattoo. I found an amazing picture of a four leaf clover and instantly knew it would work. It also for me symbolizes how lucky I am that although I have not had it easy in life, I have a family who loves and supports me, I have a house, dogs, food, I have a job I enjoy and friends who know me. I am one very lucky person! I do have plans for more tattoos, it’s something that I can control, I may not be able to change the way I look I can have tattoos that mean something to me. I asked my friends on Facebook to share their stories here is what I got. Below are stories I got from my friends when I asked them to share their a picture and story of their favourite tattoo that they have. My friend Stephanie shared a very touching story about her only tattoo which is a tribute to her childhood friend Tara who lost her battle with brain cancer in October 2008. She met Tara when she was 3 and Tara was 4, Tara’s grandmother lived in the same small town of Hillsbourgh Ontario and they met at a day camp. Every summer Tara would travel from Manatoulin Island Ontario to stay with her grandmother and each summer brought them closer together; as they grew older she shares that Tara made it a point to travel and visit more often. In 2006 Tara became a mom and just before her son was to turn 2 she passed away, that was October 25th, 2008 and Stephanie paid tribute to her friend with this memorial on November 4th, 2008. Another ribbon tattoo up next from my friend Carrie. Hers is a tribute to her oldest son Reith who got to put his name on his mom. Reith has ASD (Autism Spectrum Disorder) and the puzzle pieces are the symbol used to represent that all of the kids with ASD are like a puzzle with missing pieces, each piece is different and is a great representation of how each child is different and alike other kids with ASD. As Carries says they are all on the spectrum but in different spots. She mentions that although currently her only tattoo she has plans for meaningful second one. Carlos shared his with me and says that the Celtic ban with the NY Aries symbol represents a group that he respects. he got it while in Sudbury and that Aries is also his astrological birth sign. Jodi has 13 tattoos and when I asked for submissions her response was “just one?” I love all of her ink and learned about this story for the first time. She surprised her childhood friend on her wedding day with this tribute to their brownie days. Jodi tells me that they have been friends since they were both very young. Jodi is 4 years older and their parents were friends and as such they spent many hours together. One of the earliest pictures of the two of them is when they were both in brownies. She says that if they were ever in a fight they would give each other their brownie pin as an apology. The phoenix bird represents rebirth and my friend Joe got his phoenix tattoo to signify the changes he has made in his life after he got out of prison. He told me that not all the changes have been good but that like the phoenix he has transformed and is a better person. My friend Lisa has one tattoo and it is a tribute to her only child, her daughter. She choose this so that no matter where she is her daughter is always with her. My friend Glenn’s tattoo is a tribute to his father that he got after his father’s passing. The portrait is of his father when he was in his 20’s and actively serving and stationed in Egypt. The poppies that surround his father stand as a tribute to his 25 year service record and the cardinal is the birds that always reminds him and his family of the man they respected and loved. Glenn says that although all of his tattoos have meaning his one is his favourite. My friend Sheri says that her angel tattoo is a tribute to her mom who she knows is looking down on her. The reason people get tattoos tend to be personal and from hearing the stories my friends have shared I learned more about my friends. I love being able to connect with people on many levels sharing stories like these helps us know that although we all life vastly different lives with our own challenges we are all connected by the love we share for our loved ones. Please share your stories below in the comment section! Oh Yeah this is winter in Canada!